The Rev. 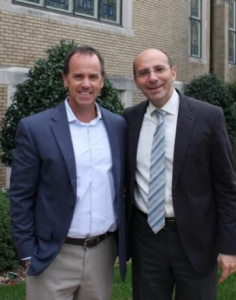 Dr. Mitri Raheb visits St. John’s in 2014. Mitri is widely considered a leader of the Christian Palestinian movement. He was awarded the Olaf Palma Peace Prize by the Swedish Parliament in 2016. Sometimes the truth is uncomfortable, but it sure is necessary when addressing some of the world’s critical issues. One such issue comes to mind: Palestine. The Israeli-Palestinian situation is a nightmare. Michelle Alexander wrote an alarming column in the NY Times earlier this week comparing the treatment of Palestinians to apartheid in South Africa and Jim Crow segregation in the US. But the Christian Zionist movement and the Israeli lobby have been so strong that everyone’s afraid to throw up a warning flag. It’s stunning, really, that Christians and civil rights groups haven’t had a fit over this. Christian Palestinians have been so marginalized that they’re leaving in droves. Bethlehem and Nazareth, once home to the largest concentration of Christians in Israel, have seen their percentages dwindle to single digits while Palestinian property and homes are confiscated by Israel, land is bull-dozed and settlements are built in their place. There is severe lack of access to decent housing, food, clean water, and schools. Palestinians wait for hours at checkpoints every day, and a large wall has been built that divides communities, neighborhoods, and even farms. The Lutheran church has been particularly active in Palestine. Lutheran churches in Bethlehem and Jerusalem are historic pillars in the Protestant community, and the Augusta Victoria Lutheran Hospital near Jerusalem is one of five hospitals allowed to serve the 5 million Palestinians in Gaza and the West Bank. Earlier this year, the US suspended necessary and long-standing funding to the five hospitals, sending the Palestinian medical community into a panic. And yet there is refusal to even talk about this nightmare in Congress for fear of being labeled anti-Semitic or, worse, a terrorist lover (because all Palestinians are terrorists, right??). In fact, members of Congress and Christian leaders around the country have remained oddly and non-courageously silent. It’s stunning, and it’s an absolute travesty. Some would label this a political issue. I label it a human rights issue that begs the religious community to stand up and cry “enough!” You can do that by becoming more familiar with the situation. Alexander’s article, referenced above, is excellent. Google “Time to Break the Silence on Palestine.” Our library has some excellent resources, as well, especially Mitri Raheb’s book, The Cross in Contexts and Naim Ateek’s A Palestinian Theology of Liberation. At some point you might feel compelled to speak with your member of Congress, asking them to consider an American policy in Israel/Palestine that respects the human rights of all. Throughout, pray that a Judeo-Christian understanding of justice will prevail. St. John’s has a strong connection to the Palestinian Christian community in Bethlehem through our partnership with Christmas Lutheran Church and the Dar Al Kalima University, a school raising up a new generation of leaders in Palestine. We will continue to advocate on behalf of those denied justice in the world, including our brothers and sisters in Palestine.